Abaco is pleased to announce one of the newest state-of-the-art gulf-front developments in Gulf Shores in the last decade! Perdido Key, the ‘Lost Key’, is a 16-mile-long barrier island set between the Gulf of Mexico and the Intracoastal Waterway. You’ll be amazed at what you find here. A rediscovered island paradise at the far western tip of the Florida Gulf Coast, it’s a place where the road seems to end, and a vibrant beachfront lifestyle begins. The Meridian is perfectly placed on 300 feet of pristine beachfront property in the heart of Perdido Key, affording its residents effortless access to the beautiful beaches that surround it, plus, award-winning dining, the eco-tourism this area is famous for, world-class fishing and boating, and numerous federal and state parks. With more than half of its land mass protected as federal and state parks, Perdido Key has long been treasured as one of Florida’s most tranquil and unpopulated beach destinations. The parks mean it’s simple for you to set out on an adventure with friends – or solo—biking, hiking, birding, diving, kayaking, fishing, camping, golfing—or whatever your pleasure. For a complete list of sales in OB/GS YTD click here. This link will expire in 14 days. Abaco in Gulf Shores Alabama will stand 24 shining stories high and include a lazy river, lap pool and all 3 bedroom floor plans. Floor plans can be seen here and range in size from 2080sqft to 2120sqft. All floor plans include a spaceous media room that could also double as a bunk room or office. Here is a link to all the 2015 sales This link will expire on February 15, 2016 so if you need this information after this date, please call us. If you just look at the straight numbers from 2014 compared to 2015, you might think that this past year was a bit of a disappointment. That might change if you dig into the numbers a bit more. 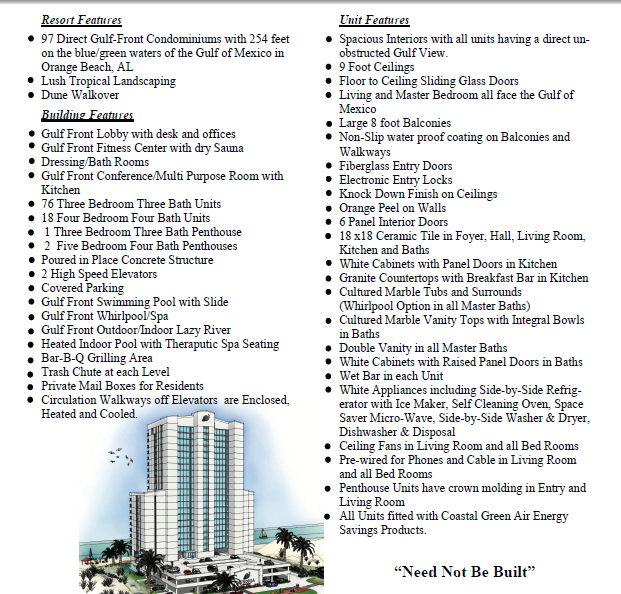 Here are the comparisons from 2014 and 2015 for Beachfront Condos in Orange Beach, Perdido Key, Gulf Shores and Fort Morgan. In EVERY category, 2015 did not perform as well as 2014. If you would like to view the interactive spreadsheet, please let us know and we will send you a copy. Can you believe it is almost fall?! Our son, Attison, will start back to school on Monday and (don't tell him) we are excited to have him out of the house for several hours each day. I am loving seeing all of your facebook and instagram posts with your kids and grand kids heading back to school. You can look for ours on Monday. Since we are almost 3 quarters through the year, I figured I would do a year to date update for you with both home and condo sales here on the coast. There have been 240 homes that have sold since January 1st of this year in Orange Beach, Gulf Shores (south of the intracoastal) and Perdido Key. This is 31 more homes sold than the same period last year and the average selling price has increased by about 41k as well. This is great news as the housing market has lagged behind the condo market as far as the recovery has gone. Orange Beach Al.- A new pre-construction complex will be built by Brett-Robinson in the form Junonia site next to the Hampton Inn. The Complex ("Phoenix Orange Beach") will be a low density of 3 and 4 bedroom condos that will be sold before construction is complete. Contact Seamitchell Realty for more details. 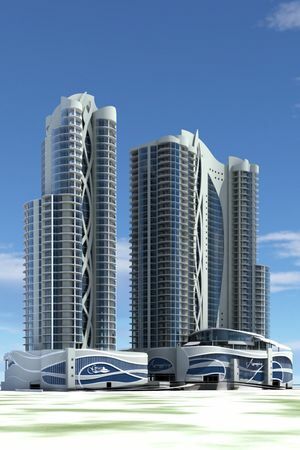 Brett said the new tower will have a design similar to Phoenix Gulf Shores with three- and four-bedroom units. The proposed project is under Orange Beach's maximum allowable density of 42 units per acre as well as its maximum height restriction of 26 floors, which includes 20 for livable units, five for parking and one for amenities. 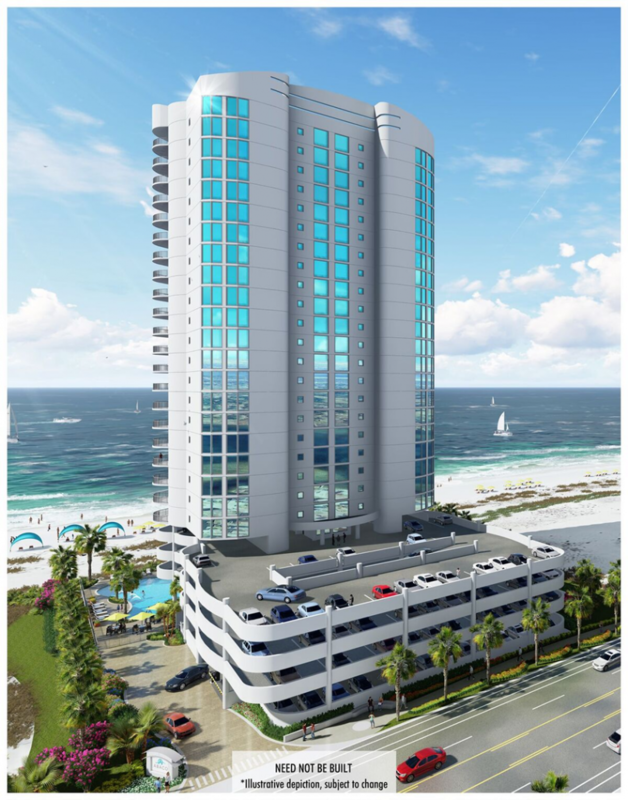 Phoenix Orange Beach will have 19 stories of livable space and an additional two floors of common areas. An eight-story parking deck will front the beach highway. The condo will feature a lazy river and an indoor and outdoor pool. Brett said the plans call for the construction of a boardwalk sturdy enough for emergency vehicles to access the beach from the property and a large-capacity drainage system near the beach highway. Initial conversations with the city have been favorable, Brett said. "Since we're not asking to come in with additional numbers of units more than what's allowed with the property as far as density is concerned, and since we're not coming in with additional height ... we feel comfortable," Brett said. "So at this point we're taking reservations from customers that we've sold to in the past that are interested in a new building in Orange Beach. This will be the first new condominium development in Orange Beach since we opened up the last one that took quite a while." We mentioned in our last update that 2 new developments have been proposed in Orange Beach. Well we found out the other day that Junonia (proposed about a year ago) will NOT be built. Despite reserving a large number of condos and having all the building plans in place, they did not start construction "on time" and have lost the option on the land from the bank. Kenny Chesney announced on Wednesday that he would be doing ONE free concert during 2014 and that it would be at the world famous Flora-Bama in Perdido Key. Interested fans, both local and tourists lined up for hours at the "Bama" for a free wrist band to the August 16th concert on the beach. WKRG Debbie Williams was there to see the crowds. If you didn't get a wristband, we have heard that you can still pay a cover and be at the Flora-Bama to hear the concert from the beach. Orange Beach, Gulf Shores, and Perdido Key Real Estate updates. 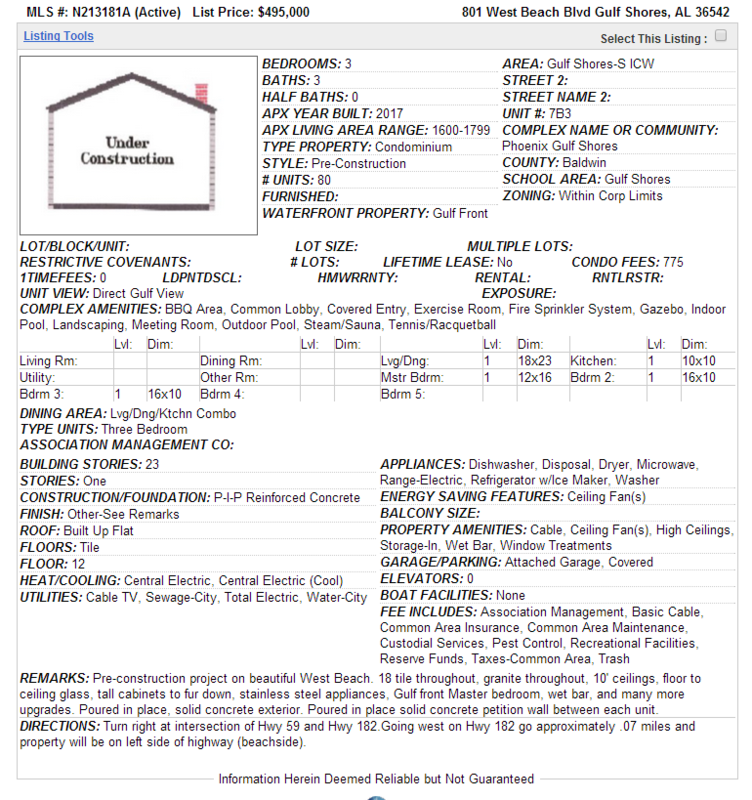 Gulf Shores , Orange Beach, Perdido Key, Condo sales info. Up to date sales numbers and listings. Here are Mid Junes Beach Sales for Condos in Gulf Shores, Orange Beach, and Perdido Key, Florida. We are your Beach Realtors for Condos and Investment property. Contact us today for New Construction! Below are the sample floor plans for the upcoming development of Phoenix Gulf Shores. The complex will have 80 units total and be approximately 23 floors tall. The complex will have 3 bedroom units on the interior and 4 bedroom units on the corners. Contact us today for more details. Brrrrrrr. It has been cold here, there and everywhere from the look of it. We hit record/near record lows here at the beach this week when temps got down to 19 degrees! We didn't get any snow, but record cold temps certainly kept me inside for work outs this week. I did something today that I never thought I would do, I ran 3.5 miles (more than a 5k) on a treadmill. Remember, I HATE running, but it is the most direct means to an end. I burn more calories running than I do biking, swimming or walking the beach. Because it was so cold out the past few days, I wasn't able to didn't want to work out outside. I could have bundled up and gone out, but I really just didn't want to mess with it. Today at the gym, my trainer and I got our wires crossed and I was there without him. What to do, what to do? Hit the treadmill. I started off with a 16 minute pace walk for about 5 minutes wishing that I wasn't going to have to do a whole hour workout on the treadmill. At the end of 5 minutes I upped the speed and elevation and ran for 5 minutes at a 13 minute pace and 3 incline. I am planning on running forf 5 minutes and walking for 5 minutes just to eek out the hour. After 5 minutes of running, I bumped the incline up to 6 and lowered the speed (so wishing I didn't have to go any more) and started power walking. The next 5 minutes dragged on as my distance crept up slowly and my heart rate slowed. The calories/minute got to be next to nothing. 5 minutes over, back to running, but at the end of the 2nd 5 minutes I did something I didn't think I could/would do. I kept running. I would first like to start off by stating that I am neither a blogger or a runner. I am not here to give you advice on training or nutrition and if you are looking for a stimulating piece of literature, you may be in the wrong place. What I am here to do is not only talk about my journey into the dark spiral that is running, and the great opportunities to participate in our community, see the sights, and stay active while on vacation at the Gulf Coast. I started working out after several years "off" in August of 2013. I never set out to run in any races (in fact, I have hated running since I was in elementary school) and I certainly never expected to be blogging about it. I "ran" my first race at The Wharf in Orange Beach. The Wharf is one of the South East's largest entertainment districts and boasts a 10k seat amphitheater, convention center, a huge ferris wheel, movie theater, fishing tournaments, condos, shopping, dining, and more. Labor Day weekend the Color Run (apparently the happiest 5k on the planet, as it is billed) was at The Wharf and several friends and my parents decided to do it together. We had a lively jaunt down Main Street and Wharf Parkway being pelted with color bombs along the way. The turn out was fantastic and the weather was ideal. I skipped about half the race to go back to my car and get a beer and I have no idea what time I finished the race. It was an event for sure and had plenty of space, music, and fun for anyone looking to be involved. Somehow, this got me started and I ran 5 more races during 2013, culminating with my final race of the year, the "Make it to the Line" 4 Mile run at the Flora-Bama. For those not aware, the "Bama" sits in between the Alabama and Florida state lines, on the beach, and is home to many events, live music daily, Sunday Worship on the Water and more. Junonia Beach Resort in Orange Beach Al. Sea You at The Beach!! !